20th Century LegaciesIn 1952, near the end of Stalin's life, 15 Soviet Jews including five well-known writers and poets were secretly tried and convicted, wrongly, of treason and espionage, because they had protested Nazi atrocities on Soviet territory and been involved in the Jewish Anti-Fascist Committee. That same year, 13 of them were executed in the basement of a Moscow prison. 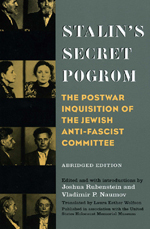 Stalin's Secret Pogrom: The Postwar Inquisition of the Jewish Anti-Fascist Committee, edited by Joshua Rubenstein (Tangled Loyalties: The Life and Times of Ilya Ehrenburg) and Vladimir Naumov (executive secretary of the Presidential Commission for the Russian Federation on the Rehabilitation of Victims of Political Repression), presents the long-suppressed trial transcript, abridged. Rubenstein's introduction, drawing on other newly released Moscow documents as well as interviews with the defendants' surviving relatives, places the "trial" within the historical context of Stalin's larger-scale anti-Semitic campaign.